Now your favorite beer-opening sandals are available in leather. 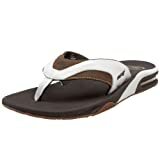 Reef makes the Leather Fanning Sandals as a tribute to pro-surfer and pro-drinker Mick Fanning. The Leather Fannings have Nubuck or full grain leather uppers that are lined with soft glove leather for comfort. A built-in bottle opener lets you crack a bottle on the beach while everyone else's beer warms up. Just be careful not to spray the only two girls at your house party with the beer you're trying to open, trust me.